Alberta Premier Rachel Notley takes part in a news conference about the state of the Kinder Morgan pipeline expansion on Parliament Hill in Ottawa, April 15, 2018. EDMONTON — Alberta has passed landmark legislation giving it sweeping power to intervene in oil and gas exports that could result in punitive price spikes in British Columbia in the dispute over the Trans Mountain oil pipeline expansion. Premier Rachel Notley won't say when and how the power will be used, but said she won't wait long. 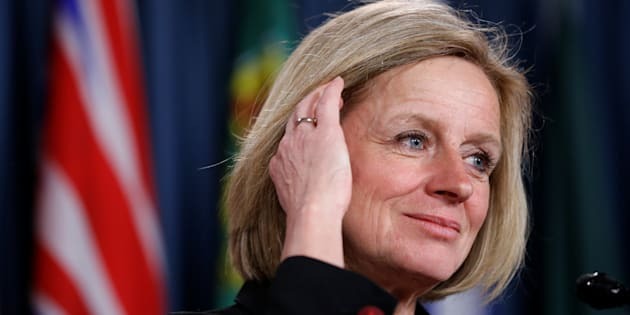 "Alberta will be equipped with new tools to assert our rights to control the flow of our resources to British Columbia," Notley said Wednesday prior to Bill 12 passing third and final reading. "Instead of asking how can we work together on this, they took aggressive action," he said in Chilliwack, B.C. But Notley said it's justified legislation, given that Alberta is losing billions of dollars due to transportation bottlenecks and the fact that B.C. is frustrating the federally approved Trans Mountain project. "Alberta has the right to act in the public interest." The $7.4-billion project was approved by Prime Minister Justin Trudeau's government in 2016, but since then has been hamstrung by permit delays and court challenges in B.C. The pipeline owner, Texas-based Kinder Morgan, has scaled back spending on the line and has given Trudeau's government until May 31 to show that there is a way to complete it. The Alberta and federal governments have committed to backstopping the project with public dollars if that's what it takes to make sure it's completed. Notley's bill echoes similar legislation passed in Alberta a generation ago in the early 1980s in a dispute with Ottawa over oil ownership and pricing.